I know, I know. You can't compare these to Christian Bale in Bat fatigues battling Bane on the streets of Pittsburgh. But then again, they haven't started filming The Avengers on the streets of Cleveland - yet. Though we originally thought filming would start on Aug. 8th along E. 9th and Euclid, it turns out that shooting actually begins on Aug. 15. Though filming has begun in Sandusky, Ohio, at a NASA facility located there. Past news reports explain that this facility can approximate outer space (we'll do a little more research to figure out exactly what this is/means), which worked well for the film. 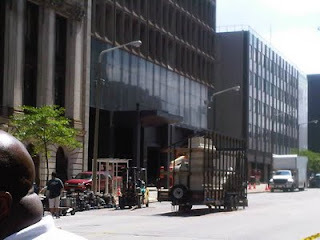 In the meantime, here are a couple more pictures from set construction downtown. These come from a friend who works nearby, who has promised more shots in the days and weeks to come. 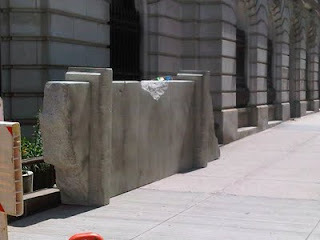 Here we see some rubble (woo-hoo! rubble!) and a better shot of the building facade. I'm still betting this is the front of Stark Tower, but no confirmation on that. 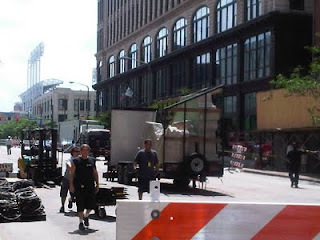 My extra-friend also mentioned that the crew intends to film some interior shots in both the building and in the Ameritrust Bank building at the corner of Euclid and E. 9th. What's great about this is that the bank building appears in Spider-Man 3. Why is that cool? Well, for me, it maintains some continuity between the faux New Yorks in Spider-Man and The Avengers. So it's safe to say these iconic Marvel heroes have done battle on the same corner of Cleve -- I mean, New York.